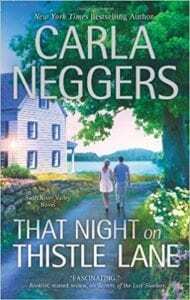 Carla Neggers’ soon-to-be released That Night on Thistle Lane is the perfect story to snuggle down into on a cold afternoon with a blanket on your lap in front of a roaring fire. A seasoned veteran of what it takes to write the perfect romance novel, Neggers doesn’t disappoint her readers… again. The story opens with Phoebe O’Dunn, oldest sister of the four O’Dunn girls going over details for the upcoming vintage fashion show at the small-town library in Knights Bridge, Massachusetts. What Maggie O’Dunn and her childhood friend, Olivia Frost don’t know is Phoebe’s discovery of the secret room in the attic above the library where she works; a room filled with vintage gowns from nearly forty years ago—all of which seems to have drawn Phoebe into their yesteryear allure and history. Unbeknownst to Phoebe is her discovery will change not only her life, but the lives of strangers in ways she could never have fathomed. Before the fashion show, however, the immediate focus is on preparation for the masquerade charity ball; an event to support a neonatal intensive care unit at a Boston hospital. Even though Phoebe hadn’t shared her secret discovery of the room in the attic, she knew this event would be the perfect backdrop to showcase some of her vintage gown discoveries. She decided to loan Maggie the beautiful blue chiffon dress Grace Kelly wore in To Catch a Thief while Olivia would don the stunning black number Audrey Hepburn carried off in Breakfast at Tiffany’s. Just like Cinderella, Phoebe would not be going to the ball… or so she thought. It is with the introduction of multi-billionaire Noah Kendrick and his partner, former NHL hockey player, Dylan McCaffrey, that the first notion of life as Phoebe once knew it in quiet and quaint Knights Bridge was about to get quite interesting. With Kendrick’s and McCaffrey’s recent public offering of their company, NAK, behind them, both men were at the headwaters of their next ventures in life. To that point, both men had established lives in southern California. The draw (and connection) that brought them to Knights Bridge was not only the charity ball, but love and family ties—some obvious, others to come soon enough. To add to the intrigue, highfalutin, Los Angeles private investigator, Julius Hartley, appears on the scene presenting the question: What exactly does he have to do with the masquerade ball? With over twenty romance novels penned to her credit, it is no surprise Ms. Neggers has found the winning formula once again in That Night on Thistle Lane. Her writing is a comfort to read at best and beckons the reader to join her as she shares a tale one cannot help to feel a part of. It is clear that Ms. Neggers is not only familiar with, but extremely accomplished in writing for her romantic audience. Her characters are believable and she perfectly captures her signature backdrop of New England time and again through her words. Never does she fall short of painting a distinct picture of the charm and allure New England is abundantly infamous for. Quill Says: Light a cozy fire, sit back in your most comfortable chair and spread that favorite throw. It’s time to settle into That Night on Thistle Lane.